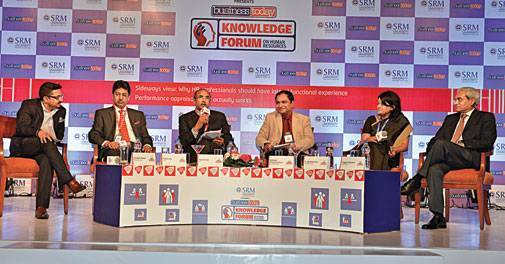 Two power-packed panels met for a brainstorming session at the BT Knowledge Forum on HR in Mumbai. The rooftop venue at Mumbai's ITC Grand Central - surrounded by imposing highrises - was the perfect setting for a bit of chit chat between a group of HR leaders at the Business Today Knowledge Forum on HR. The topics for discussion: (a) Sideways View: Why HR professionals should have lateral functional experience, and (b) Performance appraisal: What actually works. The first topic, on the need for HR executives to have work experience in other functional areas, started off with Toral Patel, Co-Managing Partner of Accord India, saying that demands of companies from the HR function have changed. "Moving from essential skills to systems and processes to integrating with the business and even managing external stakeholders, today HR is expected to do it all," she said, adding that this required HR executives to have far more exposure to the actual business. Sudhanshu Tripathi, Group President, HR, Hinduja Group, pointed out that today, HR is expected to be a diagnostician, a communicator, an interpreter, a giver of opinion on defining the future of the organisation. "All of these roles would require a much deeper understanding of the organisation - the business, products, markets, competitive forces - and the less as an HR person you understand that adjacency, the less effective you are." Adil Malia, Group President-HR, Essar Group, said: "We are now moving away from generating people-centric business organisations to business-centric people networks." And this transition requires HR folks to have business experience. At the same time, he pointed out that it was also essential for people in other functions to have a deeper understanding of HR. Sunita Cherian, Vice President & Global Head of Group HR at Wipro, said that while a lot of people have stayed in HR all their lives and done extremely well, the key point is whether you can ensure the HR function is sufficiently aligned to the strategic business objectives. "It's all about how you equip yourself to understand the business," she said. Ajay Bakshi, Director-HR of Vodafone Shared Services India, a mechanical engineer by education who started off his career in sales, said what has helped him is not only working in different functions but also in different roles in HR - from learning and development to talent management to leadership hiring. The second discussion, on performance appraisals, kicked off with Yugesh Goutam, Group President-HR, JSW Group, saying that different organisations use performance appraisals in different ways - for rewarding performance, feedback, coaching, etc. "The key is what works for the organisation," he said, and urged HR people to not be swayed by sentiments of employees. R. Mahalakshmi, HR Head (India & SA), Mondelez, said that performance appraisals can be a waste of time and money unless it meets four criteria: to what extent is it forward focused; to what extent it has brought in the perspectives of everyone that the role touches; to what extent is it fed back to the employee; and to what extent has this year's performance been delinked from what the person is actually capable of. Yogi Sriram, Senior Vice President-Corporate HR, L&T, said that reward-rating linkage, if done well, works. "If one can be non-judgemental, it works better," he said, explaining that lesser emphasis is being laid on 'why' the performance is not good enough than 'what', which is the report card that says 'average', 'very good' and so on. Prabir Jha, Global Chief People Officer of Cipla, started off by saying that performance appraisal is not an HR agenda. "And this is the problem - we (HR) have loved it because this is our little nest. It is actually a leadership issue." He pointed out the need for organisations to focus on the delivery and the mechanics of that exercise. Unmesh Pawar, Global Managing Director Talent Acquisition - Accenture, said: "Today, social, digital, technology are trending, and competition in the market place is causing a spurt of new skill sets, and that is forcing organisations to really think through what should be their DNA." And that realisation has to come through in inculcating behaviours, rewards and managing talent.